Samantha Ruiz can disappear. Due to a genetic abnormality, she has the ability to ripple – to become invisible and without substance. The trouble is, she can’t control it. When Sam’s friend Will witnesses her rippling, she finds a much-needed confidant and support. But Sam isn’t just at risk of becoming a scientific guinea pig. People with the ripple gene are dying in suspicious circumstances. Might Sam be next? In a young adult market that’s quickly filling with urban fantasy and paranormal titles, Rippler is refreshingly different. There are no fated romances, no improbably perfect characters and no nagging thoughts of having read it all before. Instead, Cidney Swanson has crafted an enjoyable story with likeable characters and an intriguing mystery that helps it stand apart from many other examples of the genre. From the beginning of Rippler, I enjoyed the fact that Sam’s ability is not without its negatives. The fact that she is unable to control her rippling makes her a lot easier for the reader to identify with. She’s not a super-powerful demigod who has never had a bad hair day and can save the world before breakfast while never breaking a sweat. She’s an ordinary teenager who just happens to have an extraordinary genetic make-up. Her insecurities endear her to the reader, while her determination to learn about herself and to take charge of her ability show an inner strength that is far more attractive than the external strength that can often be the focus of special ability narratives. Will is an equally interesting and likeable character and one of the most natural love-interests that I have encountered in this year’s reading. His friendship with Sam feels genuine and the romance between them develops at a realistic pace – to the point where it’s not entirely a romance at all. It is always so refreshing to read a young adult novel where romantic attraction is based upon characters sharing interests and life experiences. Swanson’s use of Sam and Will’s mutual interest in running supports the development of their relationship – as well as providing some of the most absorbing passages in Rippler. Will’s relationship with his sister, Mickie, is also artfully portrayed. There is a clever co-existence of sibling fractiousness and interactions that mirror those of a parent and a child, as would be expected from their family situation. Mickie herself is an intriguing character. Responsible, fearful and bereft of a sense of humour, she nonetheless exudes a surprising amount of warmth. Mickie and Will form one of three key family structures that are shown in Rippler, none of which follow the traditional nuclear form. I am always extremely fond of novels (and especially novels for young people) that portray families in all of their different forms. Sam’s friend Gwyn lives alone with her mother, while Sam herself lives with her father and stepmother, Sylvia. The positive relationship between Sam and Sylvia was one of the highlights of the book for me. The plot of Rippler is both clever and engrossing. At first, it seems like the novel will focus on Sam’s struggle to control her ability, but it quickly becomes clear that she is caught up in something a lot bigger. There is an interesting interplay between history and the present, and an underlying feeling of danger that heightens towards the end of the book; Sam’s enemy is unseen and the reasons for his animosity are unknown. My one great difficulty with the book was the way in which Sam’s abilities are explained to the reader. The second chapter consisted largely of obvious exposition, in the form of a conversation between Sam and Will. While outlining back-story and explaining universe elements to a reader is always very hard to do without it seeming clumsy, the expository section here seemed particularly noticeable to me, possibly because it was so condensed into one conversation. It is definitely worth reading through that second chapter. 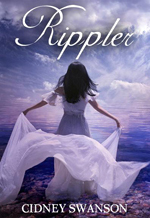 Rippler is a thoughtful, entertaining young adult novel with strong and appealing characters who interact in realistic ways. I think that Cidney Swanson has a strong future as an author. My only complaint is that the second Ripple book is yet to be released. I want to know what happens next!